My new book is out. When I say out I mean there are a pile of them sitting in my office next to other piles of stuff. The official publication date is the start of March, although Amazon says it’s out in May for some reason. Academic books tend to creep out rather than get released in a blaze of glory. Publishing an academic book is a strange experience. You think about the book for a long time before starting it. You do some research and then you write. You mess around with the structure. You work and rework individual sentences. You move bits of text around. You delete things and then put them back, sometimes in the exact place where you first had them. You think about it at night, in the shower, in the middle of films. Somewhere along the line you find a publisher, which may or may not be straightforward. Eventually, some years later, you finish the book. You’re still not quite happy with it but you send it off. Months and months later you get the proofs which you read and wish you’d done things differently. But, even though it isn’t quite what you thought it might be, you’re still quite proud. You send them back. You wait a long time. You get some more proofs. You do an index or you pay someone to do one. More months pass and then a box suddenly and usually unexpectedly arrives. It’s your book with your name on the front. You show your mum, your wife and your kids. They’re quite proud but none of them will ever read it. Then not much happens. It takes months for reviews to arrive. If they’re nice you tell people about them; if they’re not nice it’s because the reviewer hasn’t properly read or understood the book. You check it on Amazon every now and then (i.e. every day initially) and you get excited when you see it’s climbed 200,000 places in the bestseller list. Then you realize this just means you sold a single copy. You might see it in a shop. This is also quite exciting and you may move it to the front of the shelf, cover facing out so the world can see. Some people do buy the book, some of them even read it, but you have no idea what most people think of it. In today’s world of instant interaction this lack of interaction is a bit frustrating and a bit odd. But it’s no different to publishing in an academic journal where the feedback is even less and the readership can sometimes be counted on not many hands. Moreover, most blogs don’t, I imagine, have very high readerships either. Publishing on an interactive forum does not guarantee interaction. Perhaps this new book will be different. It is reasonably priced (only £15.64 at Amazon) and it has a very broad topic. I’m plugging it where I can and various media have promised some coverage. It will be in a few newspapers and on the radio. Some people may tell me what they think of the argument rather than the cover. Doing this self-publicity (like this blog) feels a little odd to academics who spent their time buried in an introspective world of teaching, research and paperwork. It certainly draws some sniggering. For academics, finishing writing is too often seen as the end of a project rather than a stage in the whole research experience. If we don’t want people to read our work, why write it at all? Why go through all that frustration and agonizing? Surely not just so we have another publication for our CV? Perhaps most academics’ reluctance to engage too closely with publicizing their work is down to a fear of just how few people are interested. 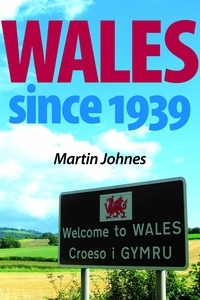 In case you missed the subtle link above, you can buy Wales since 1939 from Amazon here. Other online booksellers are available too. If you live in Wales you might even see it in a shop. The above is not a literal description of publishing an academic book. There are other parts to the process, not least the publisher’s peer reviewing. There you do get told what others think of either the idea of the book or the book itself. They are not always right.